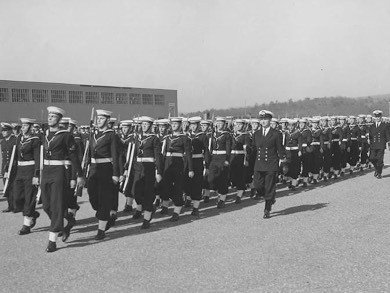 1942: HMCS Cornwallis commenced naval new entry training - becoming the largest training base in the Commonwealth. 1946: Declared surplus and closed. 1948: Re-commissioned and re-commenced new entry training to meet the demands of the cold war. HMCS Cornwallis was re-commissioned in November of 1948 and began new training, this time to meet the demands of the Cold War. The base functioned as HMCS Cornwallis until 1966 and then renamed CFB Cornwallis when the Canadian Forces was unified. The base remained active until 1994, and then closed due to a political decision to relocate the training to CFB St. Jean in Quebec.